Moody Cow Balancing Bath & Shower Gel from Cowshed will help restore harmony with its floral, oriental blend of essential oils. Rose geranium helps regulate emotions and hormones, linden blossom relieves tension, and frankincense soothes and calms. 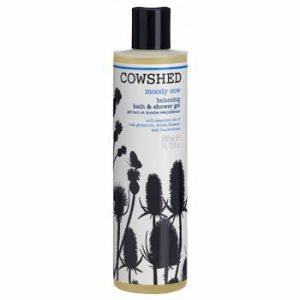 Wash your cares away with this stress relieving Moody Cow Balancing Bath and Shower Gel from Cowshed. You will be left feeling blissfully calm, stress free and relaxed. This product contains no parabens, no petrochemicals and is free from sulphates, artificial fragrances and colours. It is suitable for vegetarians and has not been tested on animals. To use in the shower, lather over your body. To use in the bath, pour liberally under warm running water for a therapeutic soak.